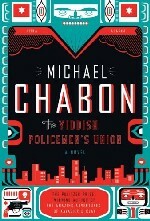 Michael Chabon's Yiddish Policemen's Union is a unique blend of alternate universe and hard boiled detective fiction, imagine Harry Turtledove meets Raymond Chandler. Chabon asks what if the Jewish state of Isreal never gained a foothold in the Middle East in 1948? What if, instead the Jewish refugees from the Second World War found sanctuary in the most unlikely quarters - Sitka, Alaska? The divergent point is based on a very real proposal The Slattery Report put forward in 1940 by Department of the Interior Secretary Harold L. Ickes. Increasing violent efforts in Nazi Germany to the expel Jewish citizens culminated in the Novemember 1938 Kristallnacht, commonly called "The Night of the Broken Glass". A few weeks after that event Ickes proposed the use of Alaska as a sanctuary for Jewish refugees displaced from Germany and Europe. It was argued that choosing Alaska would allow the refugees to bypass normal immigration quotas, since Alaska was a territory and not subject to the same restrictive quotas that states were. In our own reality the Ickes proposal was opposed by Anthony Dimond who was the Alaskan Territory Representative in the House of Represenatives and never gained the support of President Roosevelt. In the timeline proposed by Chabon, Dimond is accidently killed in a car crash removing him as an opponent to the plan. While the formation of the Jewish settlement in Sitka is the main divergent point for the setting of the novel, there are several others that are hinted at or briefly mentioned in passing in the novel including Germany defeating the Soviet Union in 1942, Berlin being destroyed by nuclear weapons, and a lengthy Cuban War. Set in present day in this alternate universe, Yiddish Policemen's Union opens with the imminent threat of the 'Reversion' of the Sitka settlement to the U.S. and the displacement of the Jewish settlers to points unknown after building a culture and a community for 60 years. True to hard boiled detective fiction tropes, Landsman is a man with nothing to lose. Having virtually hit bottom, he goes against his superiors, his partner, and common sense in an fanatical effort to solve the case and redeem himself on a number of levels. Although Landsman never acknowledges it at stake is his career, his Jewish identity, his family history, and his relationships with both his partner and ex-wife. What raises Yiddish Policeman's Union above a straightforward alternate universe novel or a standard detective fiction novel are the rich layers of details that Michael Chabon's weaves together to form a very real and believable tapestry that is this fictional world. Chabon blends Jewish tradition, Yiddish culture, Talmudic teachings, and Native American Tlingit culture with a variety of crime world and detective fiction tropes. The story builds with rich layer upon layer and as Landsman, and the reader by extension, get more immeresed in the mystery the final revelation can only disappoint to some extent. Overall the novel is a very satisfying read, rich with such detail and historical context that you'll likely be referencing wikipedia between chapters. The novel has won several awards, including the Hugo Award for best Novel (2008), Nebula Award for Best Novel (2007), and Sidewise Award for Alternate History (2007). The movie rights to the novel have been optioned by the Coen Brothers and was expected to be there next film to be produced after they finished Serious Man. It has since been announced that Coen Brothers will direct a remake of the John Wayne western True Grit first. No word on when filming of Yiddish Policeman's Union will take place. In the meantime enjoy the book! Michael Chabon's website for his writing - currently focuses on his most recent project "Manhood for Amateurs". Publisher Harper Collins page for Chabon's The Yiddish Policemen's Union includes summary, link to Michael Chabon's biography, and reading guide. An excerpt from first chapter of The Yiddish Policemen's Union as it appeared in the USA Today online version 2007-Apr-29.